Myth: It is possible to swallow your tongue. Contrary to popular belief, it is not possible to swallow your tongue. Well, unless of course if you cut it off and then swallowed it… In any event, the tongue is rooted to the floor of the mouth by the lingual frenulum. This makes getting the tongue far enough back in the throat to actually swallow it and get it stuck impossible. Also contrary to popular belief, one of the worst things a person can try to do for a someone having a seizure is to try to jam something in their mouth to hold their tongue down. They aren’t going to swallow their tongue and someone trying to jam something in their mouth is very likely going to end up injuring them and, depending on what the person used, the seizure victim might just choke on what was jammed in their mouth. The person trying to force the thing in their mouth can also end up getting their fingers bitten severely, if they aren’t careful, and it’s hard to be careful when someone’s jerking about. Depending on the size of someone’s tongue and where the lingual frenulum is attached, it is possible for a person having a seizure to have temporary blocking of the airway from the tongue; when they are having a seizure, the tongue can fully relax and fall back. However, this isn’t particularly a problem while they are having a seizure as breathing is usually suppressed anyways. It can be a little bit of a problem when the seizure is over and their breathing resumes. However, a more likely choking hazard for someone having a seizure or unconscious is the person’s own bodily fluids, including saliva and vomit, which they may breathe in once their breathing resumes; this can cause them to choke on these fluids, due to a suppressed coughing reflex while they are unconscious. In these cases though, all you have to do is turn them on their side. The tongue will then naturally fall to the side of their mouth (gravity works!) and their bodily fluids won’t run back down their throat, in both cases, freeing up the airway. For a seizure victim, rolling them on their left side is the preferred position. I was not able to ascertain why this was the case, but it was recommended by the epilepsy foundation. You should also never try to restrain the person having a seizure. Roll them on their left side and then move objects away from them, so that they don’t injure themselves on those objects. But otherwise, you just have to let the seizure run its course. 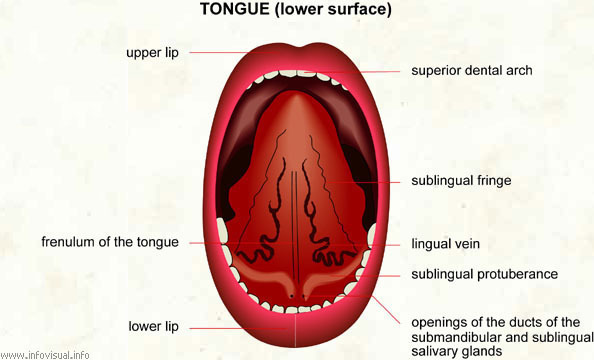 The lingual frenulum is the small mucous membrane that extends from the floor of the mouth to the mid-line of the tongue. In some people, this lingual frenulum can be so restrictive, in terms of restricting the movement of the tongue, that they can have trouble speaking. When this happens, it is known as Ankyloglossia, or “tongue-tie”. Often these people cannot even extend the tip of their tongue beyond their front teeth. This is particularly a problem for babies with this condition as they have trouble breast feeding, thus trouble taking in enough food. 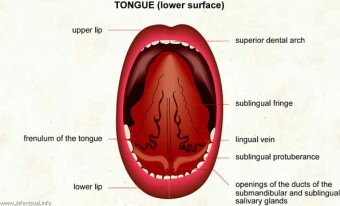 The base of the lingual frenlum contains tissue that has a series of saliva glands on it. The two largest of these are called the Wharton’s Ducts and are in the front. The tongue isn’t just one muscle, as many people say, “the strongest muscle… etc.” In fact, it’s made up of many muscles, which allows for the great range of movement most people have with it, with the muscles running in different directions. As you age, the number of taste buds you have tend to diminish. An average child is born with about 10,000 taste buds. An average elderly person only has about 5,000. This is partially why many kids hate vegetables so much. Vegetables can be very bitter to “super tasters” or those close to that. As you age and your taste buds diminish, this bitter flavor goes away somewhat and changes the taste of the vegetables dramatically in the process. The tongue never really gets a rest. Even while you are sleeping it is constantly pushing saliva into the throat, making sure you don’t drool all over your pillows. Fail article is fail, Rubens Barichello (A Formula 1 driver) swallowed his tongue after an accident during a practice session in Imola in 1994, only quick actions from the medics there saved his life. @Larry: I have a B.S. and M.S. in Computer Science along with minors in philosophy, music theory, physics, astronomy, and mathematics (along with a ridiculous amount of student loans, as you might expect from that) ;-). There’s no problem with my education, nor is their a problem with my research for this article. If you’ll check the sources (including the epilepsy foundation), or just Google around yourself, you’ll see that it is quite impossible for a person to actually swallow their tongue. Also “Rubens Barichello” is spelled with two r’s, “Barrichello”. Barrichello’s accident was a horrific one, but I could find no quote from any of the medics that worked on him that say he swallowed his tongue, just passing references from news media reports that have a vested interest in making things sound more dramatic than they actually were. Unless he partially or fully bit his tongue off, it would have been impossible for him to swallow it. A person that has a very long tongue (also depending on where the lingual frenulum is attached) can have their airway partially blocked when the tongue relaxes and falls back, but all that is necessary to unblock it is simply to turn their head or their body slightly and the limp tongue will fall to the side. It cannot get stuck down their throat. Did you really need to Put out your resume before you made your point? Because he was replying to the accusation that he had no education..
Daven, you are a legend! Larry got destroyed! Very interesting and informative article. Your research is impeccable, well done. It is possible I have a friend at school who can and does it all the time to show off. She gets it all the way behing her uvula. So it is possible so this information is wrong. @Lexi: But can she block her throat completely, even from air from her nose? That is sort of the implication in “swallowing” where it literally goes far enough into your throat for you to swallow and have it completely blocking your throat, even from breathing air through your nose, thus you’d then choke on your tongue. Some people do have long enough tongues and a frenulum attached far enough back to get their tongues back in their throat quite a ways, but actually swallowing it isn’t possible. However, again, even if she partially blocked her airway, one would need just push her onto her side, and the tongue will roll to the side of her mouth. The reason for rolling a person onto their left side during a seizure is that this position helps prevent pulmonary aspiration of vomit during the seizure. This position puts the entrance to the stomach on the high side, allowing it to not be in stomach acid (the same reason lying on your left side helps heartburn). This creates an airspace that allows for some mild stomach contractions to happen without causing the person to vomit. More importantly however this position also creates a path back into the stomach for vomit, instead of a path into the lungs, as well as an expulsion path out of the mouth without allowing pooling in the back of the mouth or throat which may lead to vomit entering the airway. While Donald may also be correct, the explanation I heard was that positioning on the left side puts the vena cava above the heart, which allows gravity to assist venous return to the heart. This helps improve circulation, especially in shocky people who might lack vascular tone. Improved circulation reduces acidosis (acidity of the blood which is common in hypermetabolic situations like seizures), and acidosis can cause vomiting. The reason that you should put them on their left side is that the opening of your stomach is slightly more to the right. If you lay on your right side fluid/food can easier flow back into your oesophagus. Not sure who plagiarized who here. Look at the publication dates of the articles and I think you’ll solve the mystery. 😉 People steal our content all the time unfortunately.